20x25x2 Astro-Sorb Activated Carbon Welded Wire Pleated | Air Filters, Inc.
Astro-Pleat™ Astro-Sorb™ activated carbon 2-inch air filters provides light to moderate odor control of smoke, pet odors and cooking odors that are absorbed and trapped with in the millions of microscopic carbon pores. 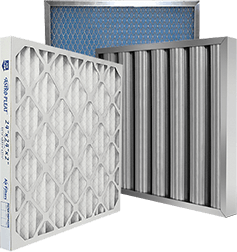 Primarily used for general indoor air filtration in heating, cooling and ventilation equipment/systems but also can be applied as an excellent pre-filter for use in commercial and industrial high efficiency systems. Astro-Pleat™ Astro-Sorb™ activated carbon 2-inch air filters are a combination of granular activated carbon (Removing gases and odor's) thermally bonded to the polyester non-woven fibers (Rated for Arrestance of 85% and Dust Efficiency 35%) that offers maximum carbon surface area, consistent carbon distribution with minimal pressure loss. Activated carbon air filters provides high filtration performance with a low-pressure drop for energy efficiency and utilizes 100% synthetic fibers, high initial efficiency, no chemical binders, and does not absorb moisture. Astro-Pleat™ Astro-Sorb™ activated carbon 2-inch pleated air filter media is supported with Welded Wire backing and is encapsulated in a heavy duty die cut beverage board frame to insure filter integrity in high moisture applications. The pleated filter cartridge is glued to the peripheral interior of the outer frame with a vinyl adhesive, preventing air by-pass.